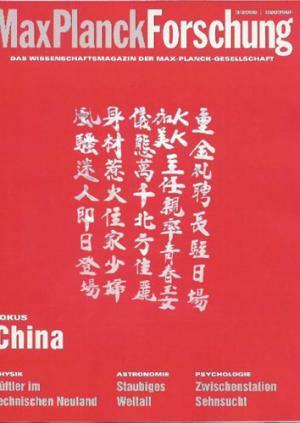 Editors had hoped to find an elegant Chinese poem to grace the cover of a special issue, focusing on China, of the MaxPlanckForschung journal, but instead of poetry they ran a text effectively proclaiming "Hot Housewives in action!" on the front of the third-quarter edition. Their "enchanting and coquettish performance" was highly recommended. The Max Planck Institute was quick to acknowledge its error explaining that it had consulted a German sinologist prior to publication of the text. "To our sincere regret ... it has now emerged that the text contains deeper levels of meaning, which are not immediately accessible to a non-native speaker," the institute said in an apology. "By publishing this text we did in no way intend to cause any offence or embarrassment to our Chinese readers. " There are tales of drunken teenagers walking out of tattoo parlours with characters reading, "This is one ugly foreigner" or "A fool and his money are easily parted". Another web-user wrote: "I recently met a German girl with a Chinese tattoo on her neck which in Chinese means 'prostitute'. I laughed so loud, I could hardly breathe." The brothel-keeper could not be reached for comment. We paid handsomely to hire Manager KK and Camay full time; They present young and beautiful girls; Northern beauties in million swaying poses; Young housewives of fiery figures; All bewitching, seductive and are here on board today. The writing in its distinctive Chinese calligraphy are usually found in stand-up poster boards written in Silver ink on red paper, decorated with paper flowers. They are displayed outside places called Ballroom in Hong Kong where inside there is no dance floor, and dancing is not what the customer has in his mind.